True enough, you’ll never get out of doings at Boracay as it boost a complete line of rest and recreation activities - from simply beach bumming, swimming, sunbathing to kayaking, parasailing, diving, snorkelling, yacht cruising, jet skiing, island hopping to even shopping, food tripping, carting, off road driving, spelunking, hiking and lots more... Boracay truly deserves as one of the best vacation haven for both opulent and budget-people alike. We arrived at Boracay on a Friday night and stayed at Bans Beach Resort of Station 1, just beside Bamboo Lounge Restaurant and Astoria Hotel. With not enough time left for the day, we just settled in and devoured our evening at The Sand Bar Boracay – known as the fire dance capital of the island. On the next day, we strolled along the shoreline of Boracay from Station 1 to the famous Willy's Rock to Fridays then to Diniwid Beach that houses the Nami Resort Boracay. The atmosphere at Diniwid is the exact opposite of the 3 stations – less crowd, no loud music -- sort of a secluded paradise. The perfect area for vacationers that seek total rest and relaxation, privacy and tranquility. On our way back to Station 1, we passed by Fairways and Bluewater Club, Butterfly Garden and the mini-zoo. After the Diniwid visit, our host friend (thanks to her for making everything happen) lend us a motorcycle for our tour around the island. 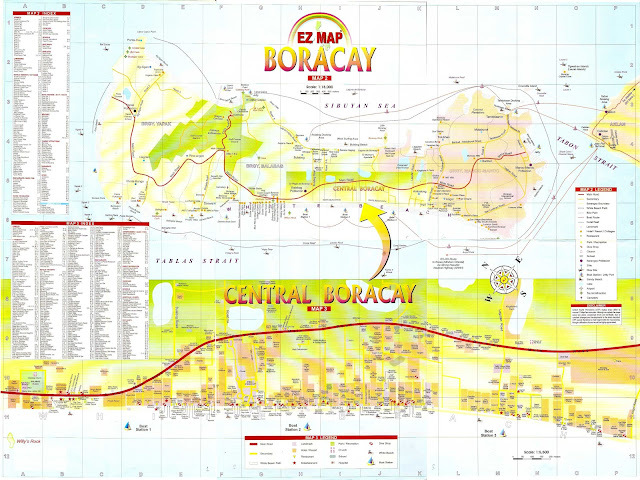 We were happy that we were able to wander almost the whole of Boracay in less than 3 hours. After our island tour, we had our late lunch served with lotus rice, orange chicken and pansit kanton courtesy of the Bamboo Lounge, the only Chinese restaurant in Boracay that serves lotus rice. The filled tummies was sleep inviting but capturing Boracay's sunset is one of my main agenda. So to deviate temptation, we strolled again the shoreline but this time to the opposite side -- to Station 3. Everybody was busy on their own -- from kids building sandcastles, guests reading books while sunbathing, kids on beach boarding, and so on. It was as we walk that I captured the view of yachts before the sun started to set. Then as the sun sets, the horizon magnificently changed from one color to another. Simply Boracay, simply amazing! We concluded our last night at Boracay with another chill at The Sand Bar. Thank you again dear friend for this unforgettable experience. On our last day, we did a quick souvenir shopping at D’mall, experienced Jonah’s refreshment and had a final shot of Boracay’s Grotto landmark -- then back to Kalibo for our trip back home. I was there in May, 2010 and it was great. We stayed at A-Rock and had $6 buffet dinners on the beach each night.